Molinari’s is one of those fine establishments in San Francisco that just keeps on doing what it’s doing without much fanfare in the food scene. I’ve been going there for nearly 15 years now and have found the sandwiches to pretty much be the same, great Italian deli sandwiches that they’ve always been, albeit with very large price increases in recent years. I’m guessing that they’re just cashing in on multiple guidebook listings. Given the fickleness of San Francisco’s “foodie” scene, I can’t say that I blame them. There is however one huge folly in the sandwiches which is what I call, “The Dicko Effect”. Years ago, when first making the trek up there for lunch, I would inevitably always get the worst sandwich-maker in the place whose name I later found out to be Rudy, but for years my fellow employees and I just referred to him as “Dicko” given that he made the worst, dry, barely-dressed sandwiches one could imagine. I started to plan my visits for the days he had off so that my sandwiches would be at the quality level I would expect from Molinari’s which is to say, delicious. Eventually, Rudy left and in recent years, I found myself going there more and more until I gradually came across the inheritor to “The Dicko Effect” which is a fellow whose name I believe to be Gino. He’s this grumpy older guy who really has no business making sandwiches anymore as they’re just like Rudy’s and you can watch him count and measure each ingredient as he puts it on. This is quite different from the other guys who work there that just put on what seems to be the right amount to make a tasty sandwich. Given that some of my favorite Molinari’s sandwiches approach nearly $10 and the chances of being Dicko-ed by Gino seem to be grow ever-more common, I am sadly going to have to throw in the towel on their sandwich front. This isn’t to say that I’ll stop going there though. They have a great, Italian wine selection with affordable bottles to drink with just about anything you’d like. Then of course, there’s the deli. 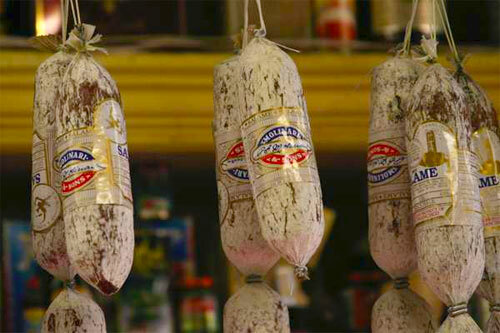 Having recently invested a few bucks in to a meat slicer, I obviously need cured meats to run through it and Molinari’s has one of the best and most affordable selections in town. That and their Italian cheeses are very competitively priced. It would just be nice if they had someone set up to only work the register so that if you want to buy deli items, you don’t need to wait for an hour with the crowds jonesing for sandwiches. For those who do visit San Francisco and find themselves at Molinari’s, pray you don’t get whatever Dicko is inhabiting the joint and go enjoy your sandwich nearby at Washington Square if it’s sunny. These guys are indeed one of the more “authentic” places around in an ever-more Starbucked world.